All the basics for hand and finger evaluation in one convenient package. 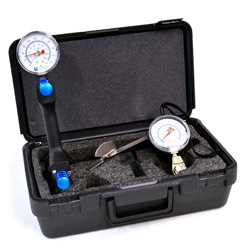 Lafayette Hand Evaluation Kit includes one each of: Lafayette Professional Hand Dynamometer, Lafayette Hydraulic Pinch Gauge, and a 5 1/2 inch Finger Goniometer. All three instruments come in a convenient storage and carrying case with individual compartments for each instrument.